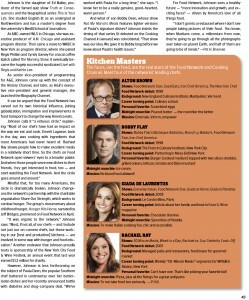 WITH BROOKE JOHNSON’S EXPANSION OF THE FOOD NETWORK BRAND, MICHELIN MIGHT HAVE TO START RATING NETWORKS. She likes going out to restaurants. Cooking, not so much. But guests of Brooke Johnson, president of the Food Network and its 2010 spinoff, the Cooking Channel, don’t go home hungry – or disappointed. Her go-to dish is a pork tenderloin – with a white-wine reduction sauce of butter, mustard and shallots. ● Energetic ventures such as “Rachael vs. Guy: Celebrity Cook-Off,” “Worst Cooks in America,” “Chopped” and “Cupcake Wars” helped cook up Food Network’s highest-rated, most-watched first quarter, with an average nightly audience of 1.3 million. ● A line of Food Network kitchenware is available at Kohl’s. ● Food Network “signature dishes” are in play at select sports stadium concessions. ● The network, with partner Wente Vineyards, sells wine under the label Entwine. ● Food Network Magazine, which debuted in 2009, is the number-one newsstand epicurean title, with circulation topping 1.4 million. “Brooke led the way in the prototyping phase of the magazine,” says editor-in-chief Maile Carpenter. “She was all about the brand.” Which is why popular Food Network chefs are sprinkled throughout the articles. But then, those faces are the most readily identifiable element of the brand – stars in their own right. 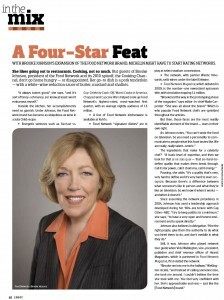 Still, it was Johnson herself who played network tour guide when Vicki Wellington, vice-president, publisher and chief revenue officer of Hearst Magazines, which is partnered in Food Network Magazine, first visited the network. Johnson is the daughter of Ed Bailey, producer of the famed quiz show “Truth or Consequences” and the biographical series “This Is Your Life.” She studied English lit as an undergrad at Northwestern and has a master’s degree from the university’s Medill School of Journalism. As senior vice-president of programming for A&E, Johnson came up with the concept of The History Channel, and later, as A&E’s executive vice-president and general manager, she launched The Biography Channel. It can be argued that the Food Network has carved out its own historical influence, joining globalization, immigration, and improvements in food transport to change the way America eats. Mindful that, for too many Americans, the circle is dramatically broken, Johnson champions the network’s partnership with the charitable organization Share Our Strength, which works to combat hunger. The group’s documentary about childhood hunger, “Hunger Hits Home,” narrated by Jeff Bridges, premiered on Food Network in April. “It was organic to the network,” Johnson says. “Most, if not all, of our chefs – and I include not just our on-camera chefs, but those working in our [test and production] kitchens – are involved in some way with hunger and food education.” Another endeavor that Johnson proudly touts is sponsorship of the New York City Food & Wine Festival, an annual event which last year earned $1.2 million for charity. For Food Network, Johnson sees a healthy future – “more innovation and growth, and exciting faces” – driven by America’s love of all things food.